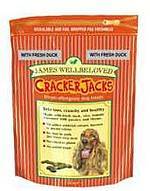 Treats that are actually good for your dog! Natural ingredients with no unhealthy additives. Dogs love the taste of the pure, natural ingredients. Hypo-allergenic and good for your dog. No unhealthy additives: No added artificial colours, flavours, preservatives or sugars. Foil wrapped in a resealable pack for that just-cooked taste. 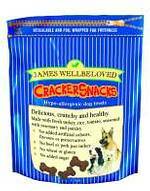 Click here for more information on all of the James Wellbeloved treats.